Just watched the first two episodes and what I think? FANTASTIC. The acting and writing so well done, this show is so good and it just started. And it's Episode 1 sub already. That quick. I'm so happy. I'm about to watch Ep 1. Read praises for the drama from netz about excellent acting, writing, story, camera angle. Lemme check. I like courtroom room drama. Older twin Han Soo Ho (Yoon Si Yoon) stabs his kidnapper in the abdomen, who attempted to kill him. He was severely injured, but managed to escape from them because of that. When the character Han Kang Ho acts with his older brother Han Soo Ho, the acting seems unnatural. He's not a judge, but is pretending to be one, he seems unnatural and acting over the top. The director wanted him to act this way. I'm enjoying this while watching. Because there are two characters, he did both really differently. The younger one is a little childish, and over the top, and the older brother is a serious character... He tried to save his character, which made it seem a little exaggerating. But didn't he do well... and it's so interesting, I don't feel uncomfortable watching his acting. I think Yoon Si Yoon did well? And he fits his character too...? Seriously, been a while since an interesting drama came out. ㅠㅠㅠ I'll be a first broadcast killer for sure. Actress Lee Yoo Young's voice is too pretty. 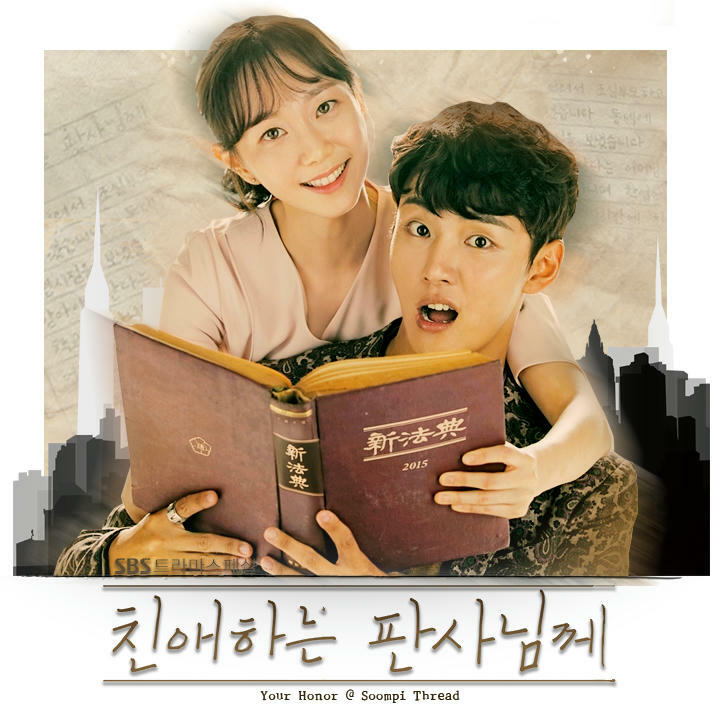 The chemistry between Yoon Si Yoon and Lee Yoo Young is good. 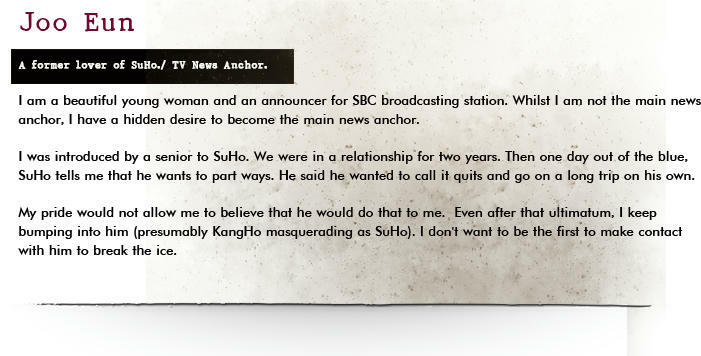 I'm curious to see how Kang Ho will change in the future. They wrote an interesting script. ㅋㅋ Lee Yoo Young's acting at the end is awesome.. Needless to say for Yoon Si Yoon. Seems like they are going to show Yoon Si Yoon's over the top gangster life slowly changing because of Lee Yoo Young. Yoon Si Yoon's acting makes one more absorbed in the show. Love it. Thumbs up.Wow. I just finished Ep with sub. I didn't want it to end. It's that good and entertaining and I terribly enjoyed it. This early. Gotta my current favorite. And that's after watching just Ep1. Yoon Shi Yoon. 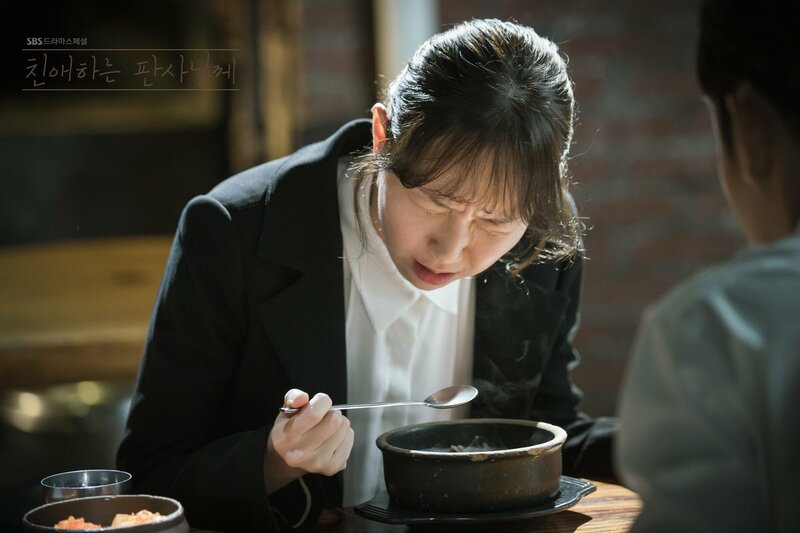 First off what I love about this drama is the natural acting. The wonderful acting! We all know him as As Kang Ho the wild child. The facial expression, that smirk. He never lost that through out the episode and as we see his bad character. Lee Yoo Young. I see now why she chose this drama instead and not declined Terius Behind Me with So Ji Sub . Her character here likely suited her better and. Good acting too. As Song So Eun who's getting that unwanted sexual harassment from her perverted prosecutor boss Jung Soo who has power and tries use it against her. LYY n this drama looked young as compared when I first saw in Tunnel. She's 28 same age as Shin Hye Sun and Won Jin Ah (27) they're later bloomers in kdrama with good acting skills. I realisse now all are female leads in current dramas airing. Happy for these actresses. Hyeo Sung Tae. That prosecutor boss. I want to hit his solar plexus, kick his shin and pound his knuckles. 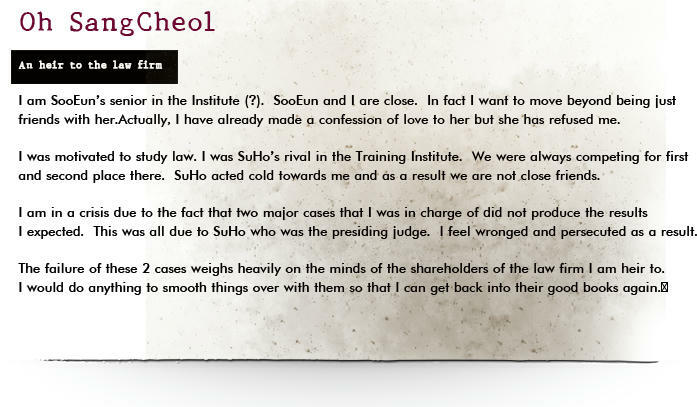 He was sexually harassing So Eun ( in the women's rest room, the bar, gosh, even in the interrogation room, feeling her up in her bum) He's also twisting her words in front of the chief prosecutor. That scene when she was reporting the abuse, we see know scumbags and the rotten ones. They probably cover up things and do favor for politicians those with power. I can see that in future episodes. Park Byun Eun. He's SE oppa ( read: friendzoned by So Eun " Don't come any close. I just want us to be friends" ) who I feel will suffer the most from that father of his. The scenes with SE, he comforts her listens to her. tells her to rely on him.. then got friend zoned. He seems good. I felt bad for him when the father slapped him but I wonder if he will have a dark side. The character I dislike most was the mother! couldn't even comfort Kang Ho even after he got hurt, all she thought about was the other twin, Soo Ho- yep, the judge. She said don't embarrass your brother judge. I perfectly understand the his resentment. I've see so many familiar actors and I like that this drama filled with good ones. Oh and the writer.. none other than the one who wrote brilliant drama Chuno. Can't wait for ep 2 to be sub. I've watched ep 1-4, and i'm quite confused with nearly all the characters except for LYY who seems to be quite straightforward (for now). Need sometime to understand who is who. And i cant quite grasp if both brothers are super corrupt or is the judge being misunderstood, the jailed twin is a bad cookie (returning to jail for various offences, and also major identity theft and imposing as a judge) despite him being misunderstood when he was trying to protect his twin. As of ep 4, i feel that the twins are both just corrupted but in different ways. The only morally sound main character seems to be LYY but she also has a dark past. Yay!!!!! The rating is going up!! It got 7.7%!!! Haven't finished watching the episode 1 but what i have in mind is that the twins just got separated by the misunderstandings they have of each other. Every story has that conflict I guess. 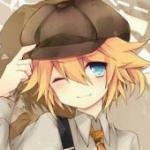 What bothers me is why the elder brother lied at the police station. That's where their gap got wider. The difference between the twins was something that the parent had to fix early on childhood. An elder brother of a year or more became sweet and caring to the younger if it was installed by the parent. But twins? They should have a tight knit bond, and they say what happened to the other twin, the other should have sensed it (if that was true). Anyway, I still have to finish the episode then the second. 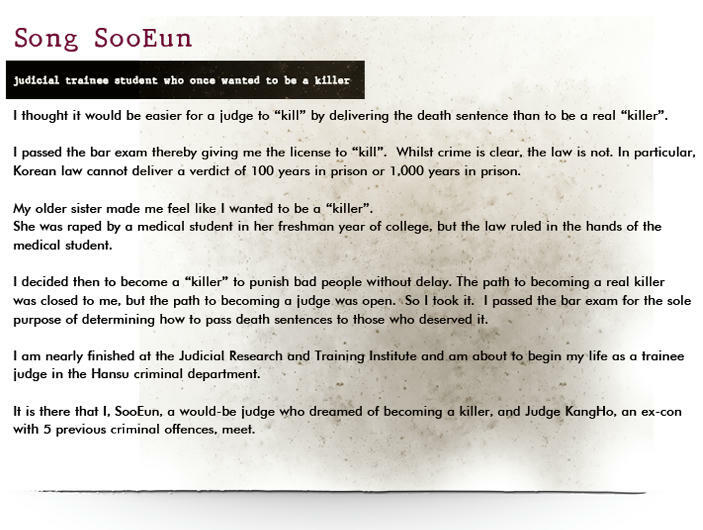 And yeah, that Prosecutor boss, I don't know what's with him doing that to SooEun. Just plain harassment? My first sight of him, he already looks creepy. @rachelyun those videos, thanks! Though my Hangul is very limited, the problem I have with SBS YouTube is that they don't have English subs. I have friends who are identical twins and as they mature, they will do everything within their means to actually distinguish their own identity apart from the other twin...which is why in schools, a lot of the time, they choose to separate the twins in classes to allow them to grow into separate individuals because people always compare them to each other and it's not healthy. So whilst some twins don't mind the bond, others really resent the comparisons. 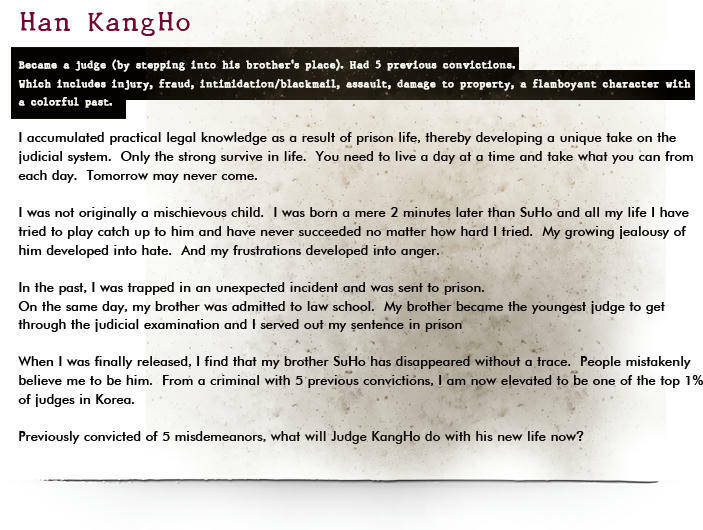 I think inadvertently, their Mom (in her well meaning way because she really wanted KangHo to change his 'bad' ways) pitted KH against SH by constantly using him as the exemplar. And in many ways, KH was acting out by getting into fights and being on the wrong side of the law (he said it was his way of getting back at his Mom - but he was conflicted because he confessed to SE whilst he felt happy to see her tears (she hurt him so he's just getting back at her by hurting her), at the same time, he wasn't happy to see her crying either...revenge can be sweet initially but it leaves a bitter aftertaste. It's quite common for children/adults to act out to gain attention. Better to have some attention (even if it is bad) than no attention at all. It's a cry for love. And from SH's side it's not a bed of roses either. There's a resentment against KH which played out at the police station (reasons which will probably be revealed down the track). He's not a happy man despite all appearances. He was resigning as judge (letter of resignation on his table on the night he was kidnapped). I think he had broken up with JE(Nara) hence the scene where JE was tempted to delete the couple pic as she was prepping to read the news. When you get to the very top and everyone worships you, there's a whole lotta pressure to stay on top of things so that you stay on top...and often, it's actually a very empty, deflated feeling because you think, "what now?" Yay...and I hope it will go up and up and up ...thank you for the update..
Lead actors Yoon Shi Yoon and Lee Yoo Young eyes and expression speak volumes! Some Lee Yoo Young goodies! Scenario, chemistry, artistry all are in leading to obtaining a successful outcome. So with both hands thumb up!